During the Olympics, we often hear stories of committed parents who drive their kids to practice every day at the break of dawn to help them become champions in their sport. These parents are amazing. They are dedicated and loving. But I’m not sure we should all try to be them. 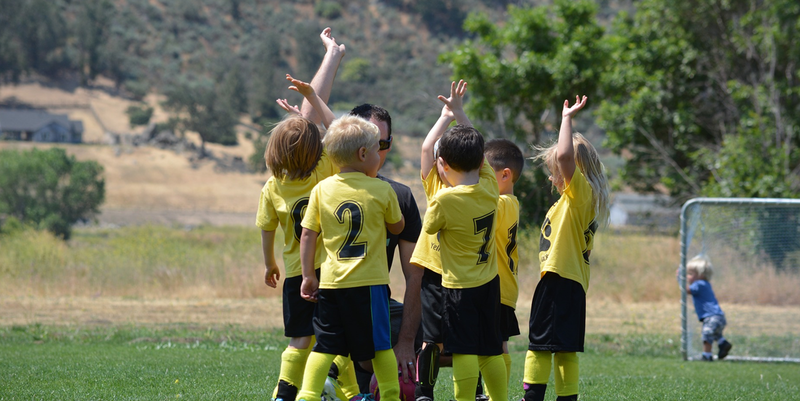 Since my 9-year-old son started playing “organized” sports four years ago, I’ve noticed a trend: the seriousness with which parents and youth coaches take organized athletics, for teams as young as 5 years old. In my son’s first (kindergarten) Friday Night Lights team, the coach had a laminated playbook that the kids were meant to memorize. He’s since graduated to an on-field iPad. But still—you get the point. In my other son’s 1st-grade Friday Night Lights team, we’ve already resorted to a “starting quarterback,” a situation that means 90 percent of the team never even learns to throw. Five days each week, my kids have a sports activity—either practice or a game—before making it home for the grind that is dinner and homework and bath time. Some of their friends are shuttled from one practice to another—on the same night—before having the chance to take a break. The truth is, sports aren’t fun anymore, and kids are quitting because of it. Step away from the parent circle. Your child does not need to master soccer by age 6 to get a scholarship in college. In fact, if he’s on a travel team at age 6, he will likely be burned out by middle school. What’s more, the vast majority of kids playing sports today will not get an athletic scholarship—and there’s nothing wrong with that. Sports are for fun, not full rides. Are you asking your child to play this sport because it was important to you—a way to live out your childhood dreams? If so, take a moment to step back. This is your child’s experience. Forcing your dreams and expectations on him or her will breed a sense of anxiety that could last a lifetime—especially if they are not gifted with the same athletic genes. Coaches might set practices at three times per week, but you don’t need to attend all of them. As a parent, you have last rights on deciding how much is too much for your child. Is it OK to devote five nights to sports, rather than simple down time? That’s a family decision, not a league one. Be sure to touch base with your child regularly to ensure they are still having fun. After all, that is what youth sports are supposed to be about. Today, youth sports is a $7 billion industry. That doesn’t mean you have to support it. Help your child stay grounded by making decisions that will support their love of the game—and themselves.